Google has launched HP Chromebook 14 netbook in India along with Acer C720 Chromebook. The HP Chromebook comes with a 14-inch 200 nit display with 1366x768 pixels resolution and 16:9 aspect ratio. It runs on Chrome operating system which is based on Chrome browser and powered by Intel Celeron processor with Intel HD graphics. HP Chromebook comes with 4 GB of RAM, 16 GB of Solid state storage, Dual-band Wi-Fi, Bluetooth 4.0, HDMI port, memory card slot, one USB 2.0 port and two USB 3.0 ports. It provides 9.5 hours battery time. It comes with an offer of 100 GB free Google Drive storage for two years. 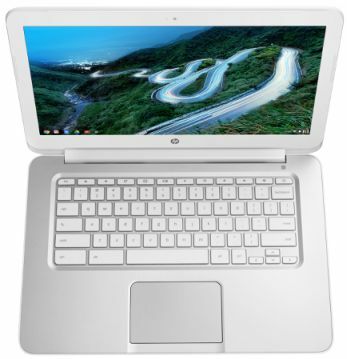 The HP Chromebook 14 comes in snow white color and it is priced at Rs.26990 officially. It will be available from selected Relaince digital and Croma stores in Delhi and Mumbai from October 17, 2013. You can pre-order this netbook from Flipkart starting today.